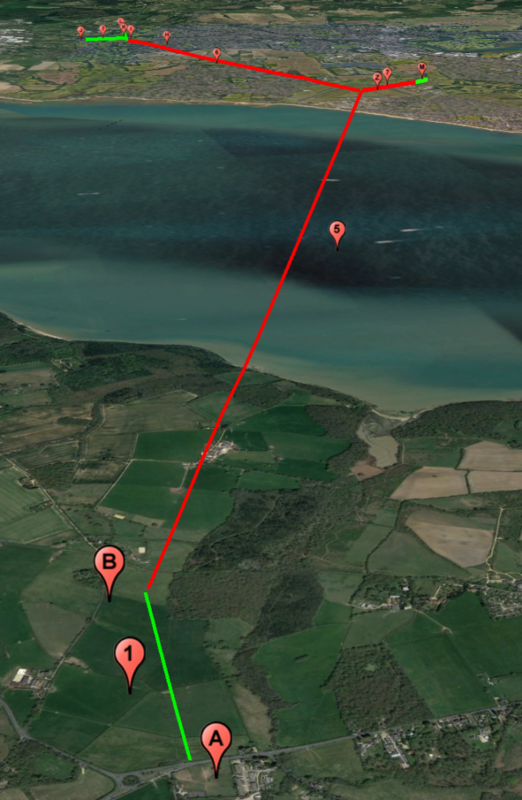 At the end of 2014 before PRO-LINK was formed, Carl Feeney devised an initial tunnel route that spanned from Arreton on the Isle of Wight to Near the M27 on the mainland. The scheme caught the imagination of the media and islanders. It brought the question of a Solent fixed link very much into the public domain, where it has been discussed extensively since. 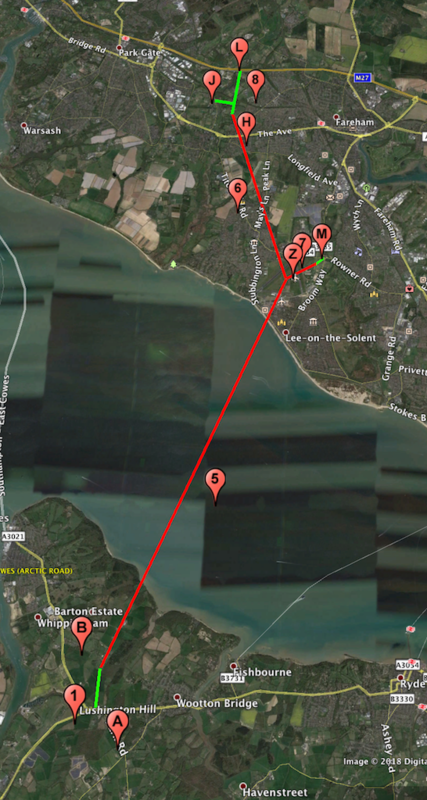 The Portsmouth and Southampton authorities quickly became interested in the tunnel route. They realised instantly that much traffic travelling to or from the Isle of Wight, would no longer be required to pass though their already congested cities. Knowing that this traffic also causes pollution problems while being marshalled and loaded on to ferries, especially in times of extreme temperatures (heating or air-con while stationary), they had no objections. During September 2017, the Isle of Wight Council officially endorsed its support of an Solent Fixed Link Viability Study… more specifically, a study into the line of route scheme of the ‘Solent Freedom Tunnel’ (SFT) that PRO-LINK has devised. The study has been recommended to be done by the IOW Transport Infrastructure Taskforce. The IOW Council have stated that for political reasons, they want to make it clear that they endorse the support of the study… but not the Solent Freedom Tunnel per se. This is their position until more conclusive evidence from studies is available. PRO-LINK respects that the IOW Council’s position is the most appropriate. Site visits have concluded the best areas for a ‘three portal’ tunnel scheme, which will create an effective and fast NORTH / SOUTH route of vehicular access that at present does not exist in Hampshire. 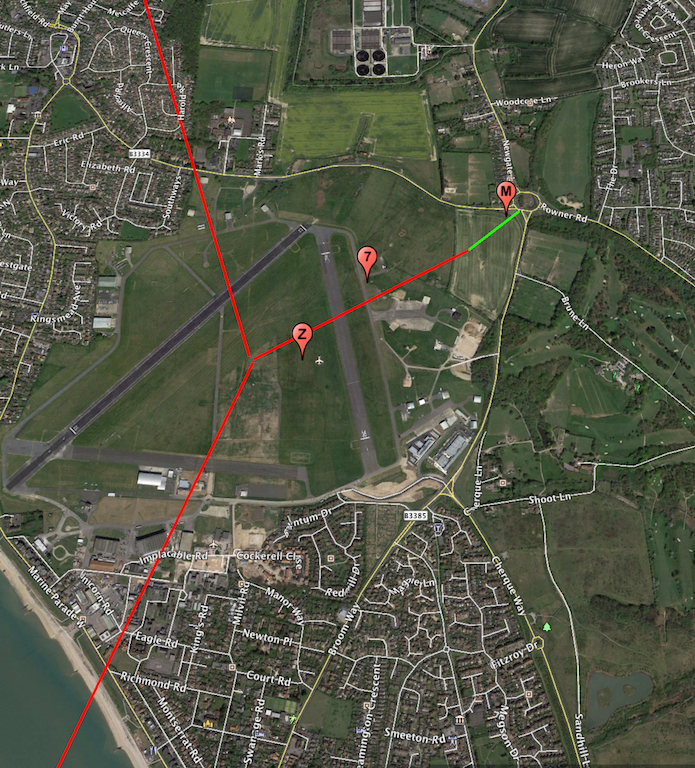 This axis will extend directly from the M27 East of Whitley, to the coast at Lee-on-the-Solent and then on to Whippinham on the Isle of Wight. The scheme will incorporate approximately, just 3kms of exposed surface road. All other construction will be subterranean. The proposal for the Northern element of the tunnel, is firmly dependent on the toll income derived from the Solent Freedom Tunnel element. Without that substantial SFT toll income, it is presumed the construction costs of the Northern Tunnel to reduce existing land traffic, would make it unviable. Both private and public funding is envisaged as the most likely way to pay for the project – two thirds and one third respectively. It is estimated that the Solent crossing element of the project will generate an annual revenue of circa £200million, with a further smaller amount of toll revenue (to be assessed) from the mainland element. This has the ability to raise two thirds of the circa £3billion of estimated build costs. PRO-LINK are confident that more than a £billion of project regional economic regeneration benefits, increase tax revenue and healthcare savings, will be achieved to the UKPLC purse within just a few years of operation. Ultimately, this project will pay for itself. At present, the two IOW ferry companies have a yearly revenue of over £110million, operating sporadically just a few hours of the day. Conversely as a comparator, the Stonehenge Tunnel will commence construction in 2021. It will cost £1.6billion. The three kilometre Stonehenge tunnel is very expensive due to its significant heritage location, yet is proposed merely replace an already existing road. The new tunnel based dual carraigeway road will have greater capacity, reduce noise and visual intrusion… but create no income from tolls, relying on purely regional economic benefits to consider it worthwhile. It is believed that the Solent Freedom Tunnel, when compared to the Stonehenge scheme, is a far better offering to to the public purse and regional benefit, producing both an economic and physically tangible income for perpetuity. The most likely process of construction in summary. Two Tunnel Boring Machines (TBM’s) will start work at ‘Daedalus Enterprise Zone’ (DEZ) at Lee-on-the-Solent, after a ‘cut and cover’ intersection portal excavation has been established. 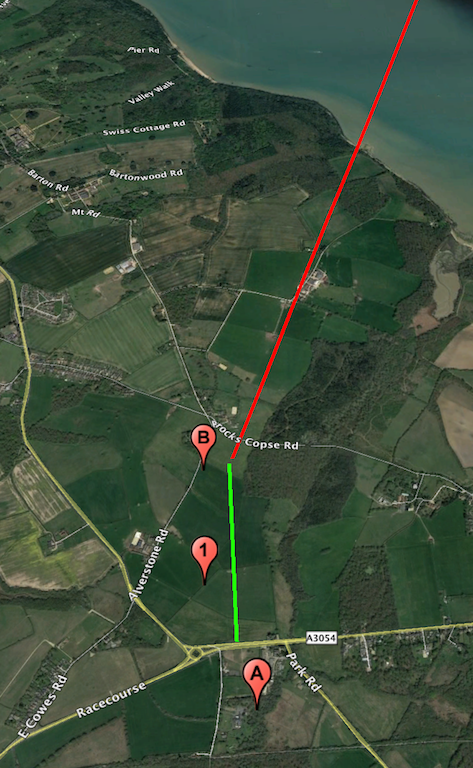 One TBM will head 4.8kms North towards a pre constructed twin portal ‘face’ at Catsfield, 1.3kms away from the M27. It will then be deconstructed, turned and reconstructed to head back to the start, forming the second parallel ten metre diameter tunnel. Similarly, the second TBM will head 10 km South towards a pre constructed twin portal ‘face’ at a location 800 metres away from the ‘Race Course Roundabout’ at Whippingham on the island.It will then be deconstructed, turned and reconstructed to head back to the start, forming the second parallel tunnel. 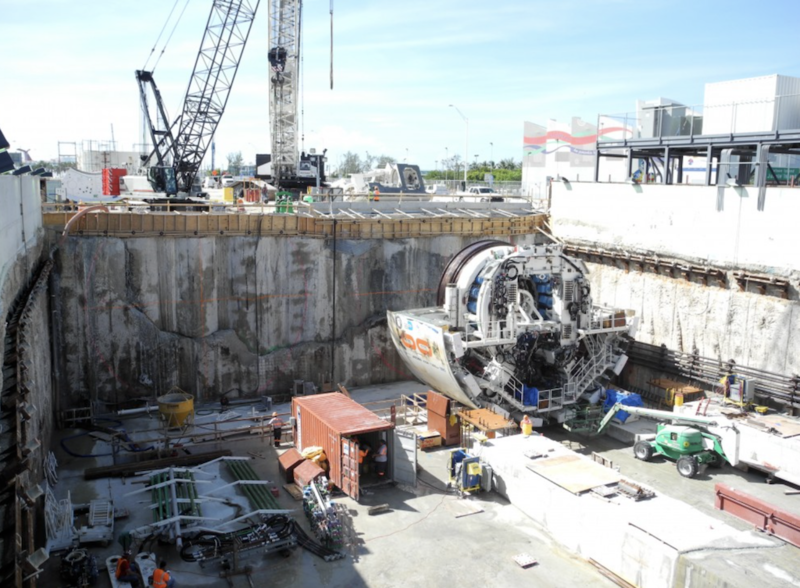 The TBMs will be removed from where they started, most likely shipped in and out by barge / crane. Tunnel spoil will be transported via conveyor belt to barges at a specially constructed temporary or permanent harbour at Lee-on the Solent, designed to protect the slipway adjacent to the DEZ from the predominant South Westerly winds. This will avoid road transportation of spoil and create quick entry of materials / equipment and exit of substances. Many scenarios are envisaged for the spoil, including mud flats for migrating birds to offset the potential development of the ‘Dibden Bay’ location, which would expand the port of Southampton. As an example of what has been achieved in the past, a national park was constructed with the spoil from the ‘Channel Tunnel’. The only factor that can restrict the potential use of this abundant material, is the imagination. Tunnel Segments will be shipped in, or constructed at a specially formed plant at the DEZ, with materials to form the segments being transported in by barge to the new harbour… and then by conveyor belt to the final construction location. A section of dual carriageway will be formed from the North Portal to connect to the new Junction at the M27. Favourable slip roads from this element will need to be assessed. A section of dual carriageway will be formed from the South Portal to connect to the new Junction at the A3054 Lushington Hill. A section of single lane contraflow road will be formed at the Daedalus portal, to connect to the Rowner roundabout or an alternative. The proposed line of route. L – New M27 Junction (design to be defined). Elevation above highest astronmical sea level – 14 metres. 8 – Dual carriageway from M27 Junction to North Portal – approximately 1.28kms. H – Northern Tunnel Portals (exact position to be defined). Elevation above highest astronmical sea level – 25 metres. 6 – Dual bored ‘mainland element’ tunnels – approximately 4.78kms. Z – ‘Cut and cover’ central intersection portal at DEZ (connecting surface road infrastructure – to be defined). Elevation above highest astronmical sea level – 8 metres. 5 -Dual bored tunnels – approximately 9.95kms. B -Dual Southern Tunnel Portals. Elevation above highest astronmical sea level – 30 metres. 1 -Dual carriageway from South Portal to new Junction at the A3054 Lushington Hill – approximately 0.82kms. A – New junction at the A3054 Lushington Hill (design to be defined). Elevation above highest astronmical sea level – 25 metres. Closer detail of M27 to intersection portal location at Daedalus Enterprise Zone, mostly of which will be shallow ‘cut and cover’ construction. Closer detail of locations for the new M27 Junction and also the dual carriageway to the North portal, with one option for slip roads. This location may be ideal for a public transport hub that can incorporate taxi, tunnel transit bus exchange (potentially BRT) and a station for the mooted Southampton – Portsmouth tram, proposed to run on the nearby rail line. 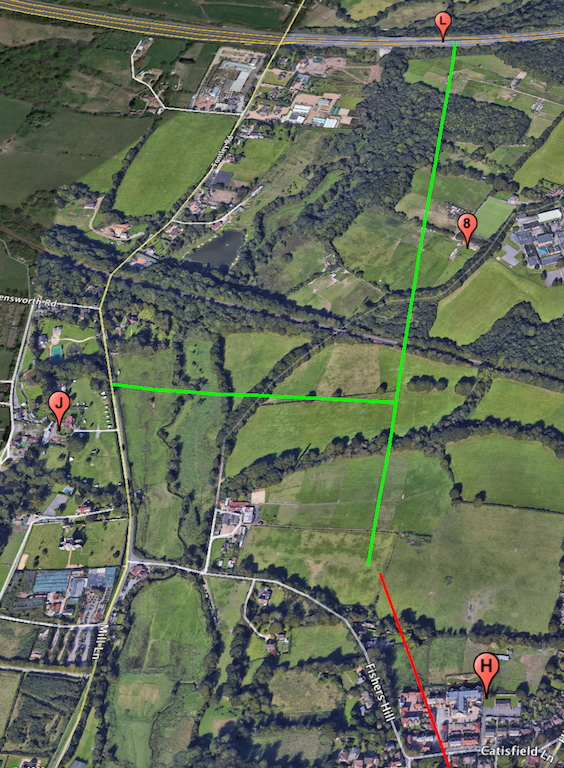 The Green lines show the total surface road ‘visible’ elements of the scheme. One enviromental offset, will be the opportunity to sympathetically regenerate Portsmouth, Southampton, Fishbourne and East Cowes ferry ports and marshalling areas. A seamless three minute journey from the M27 to the Daedalus Enterprise Zone area and then a six minute journey from Daedalus Enterprise Zone to Whippingham IOW. An opportunity to integrate the mooted Southampton / Portsmouth Tram and extend the ‘Eclipse’ Bus Rapid Transit (BRT) from Gosport / Fareham to the SFT scheme. 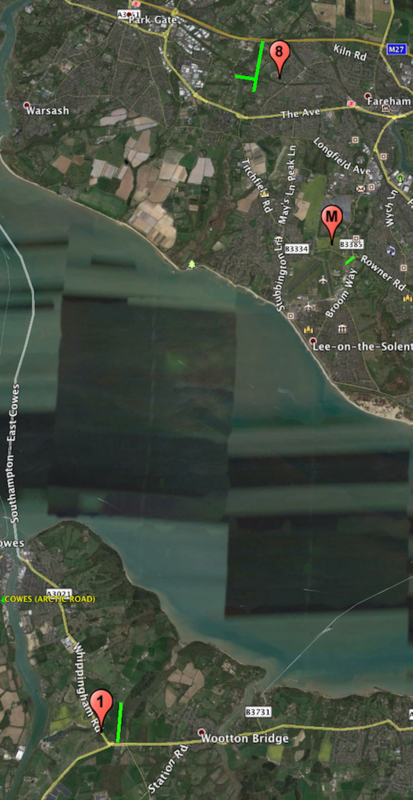 Agglomeration of business and service resources across the Solent and through to the M27 artery. 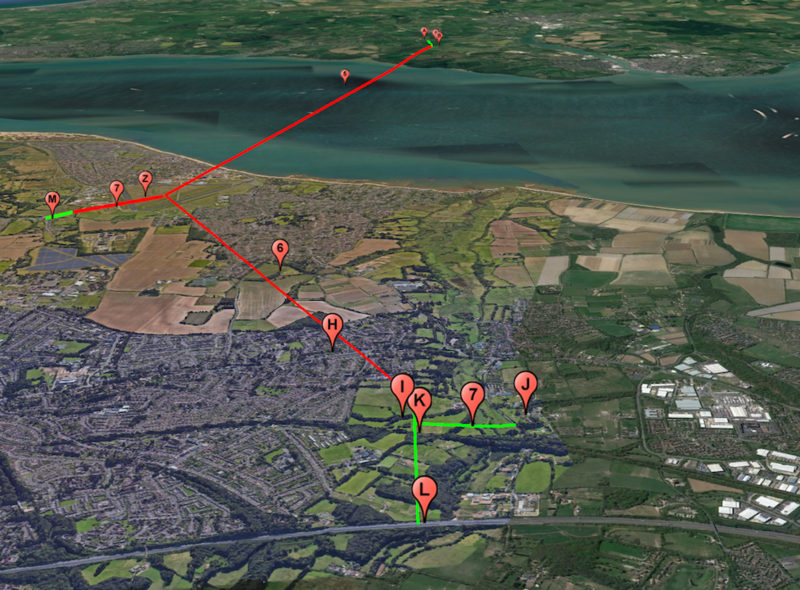 Improved mobility for the Gosport peninsular, which at present becomes frequently gridlocked. Traffic management and limitation, using toll pricing through both the ‘mainland element’ tunnel and the SFT. Land Value Capture on increased asset value and associated tax revenue, to local and central Government purse. Fast North / South axis of 24 hour, 365 day reliable freedom of transportation for business and services. Wage parity on the Isle of Wight with that of the South East. This is estimated at over a £500million p/a increase to the island’s ‘circular economy’. Increased GVA created by time saved not waiting and crossing the Solent by vehicle ferry (average 1.5 – 2 hours… sometimes far more). No requirement to drive through the two congested city centres of Southampton or Portsmouth, to access present day ferry ports. Improved environment – due to reduced emissions from vehicles that continue with efficient momentum, rather than stopping / waiting at ferry marshalling yards. opportunity to sensitively regenerate the Red Funnel and Wightlink ferry ports at East Cowes, Fishbourne, Southampton and Portsmouth to serve each community. The ‘Solent Freedom Tunnel Scheme’ creates the opportunity for the Isle of Wight to become ‘Exclusive’ rather than ‘Excluded’. Studies are required to ascertain what economic, social and service benefits would be gained from the project… not only for the Isle of Wight, but also for the greater region of Hampshire and beyond. The initial study required though, is a relatively inexpensive Viability Study. This will ascertain certain criteria in order to understand whether the scheme is in fact viable…. how much will it cost to build and can it be paid for, using toll income and the regional economic benefits and revenues that it will create?